It seems that, barring a late burst of heat, summer is almost over. I love the summer and am sad to see it go. Cooler days and darker nights can be a come down after the sunny days of August so to cheer myself up I feel I should update my wardrobe a bit. I can't help but feel that the autumn me needs a new look, some new colours and a swish new style. I've always loved natural colours and brown shades, so I should embrace that autumn look I think, with some new oversized jumpers and some long brown boots, perfect for tramping through the woods and along the seashore. Luckily the lovely people at Jord Watches are here to help. They sent me a unique watch in Koa wood and rose gold, with just enough sparkle to lift the inevitable gloom that winter will bring. I live close to the coast and adore a beach walk, and while I'm bemoaning the loss of summer I will really enjoy those last golden evenings of autumn after the holiday makers have returned home where I can wander alone with my dog, looking out to sea and of course, watching the time on my lovely wooden watch. 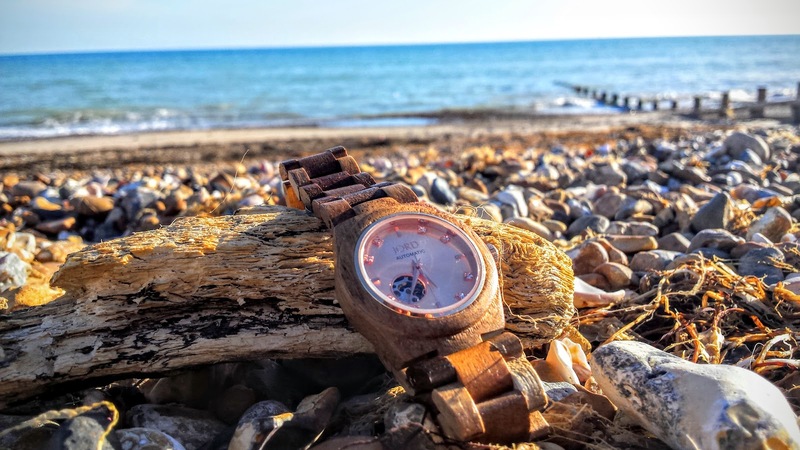 The Koa and Rose Gold Cora watch I have for review is simply beautiful. Taking the best of natural colours and combining them with stunning craftmanship. I've always admired skeleton watches, and this one, with automatic movement (encouraging me to wear it daily and keep active - who needs a fitbit! I need to move to keep my watch wound!) is really gorgeous. 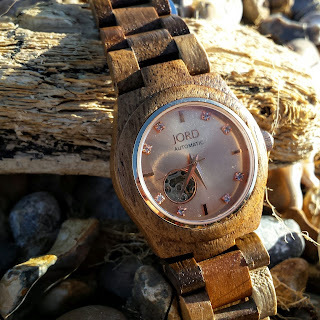 The Cora watch is slightly heavier than the Ely (battery) watch I reviewed before, due to the mechanism, but it's not a heavy watch, the wood has very varied tones which I think add to it's charms. Cora is available in other colours - all very pretty. 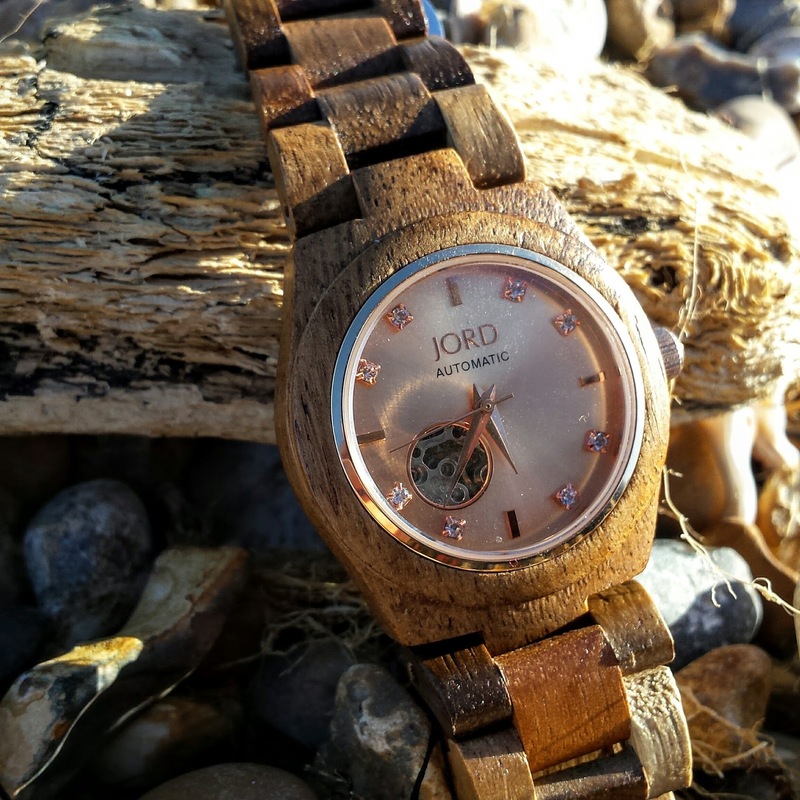 Delivery time from America is remarkably fast, and the staff at Jord are really helpful in sorting out what you need, you can even send a note of your wrist size and have the watch strap sized for you before it's sent.